Here are four reasons why your organisation should swap out the word document for the webcam sooner rather than later. Love them or hate them, company newsletters have been a staple of office life for more than fifty years. From the office memos of the 1980s to the intranet bulletin boards of the early 2000s, the corporate newsletter has been used to announce everything from new HR initiatives to company IPOs. The question is, do they really work? In an age of super-fast communication, waning attention spans and the “rise of the millennials”, does the humble newsletter still hold a place in modern business? On the one hand, company newsletters have never been more important. With remote working initiatives and employees now scattered across the globe, ensuring that everyone is educated, informed and working towards the same goals is essential. The shift in employee expectations is increasingly rendering the traditional written form of a newsletter (email or otherwise) obsolete. Reacting to these changing expectations, many of today’s businesses are now exploring new options for company-wide communication, with video-based newsletters and live-streamed updates from senior management proving some of the most popular use cases. Research shows that 76 per cent of businesses are using mass-distributed emails to announce company updates and ensure that staff are informed. As the quantity and speed of communication increases, employees are becoming much more discerning in the ways they filter through it. Unless an email is essential and provides a direct call to action, today’s workers are more likely than ever to either skim-read the contents or simply file or delete it without even engaging with it. As expectations for visual communications in the workplace rise, this issue is only set to get worse. By switching out long-form written content with video updates, business leaders can make sure staff are engaging with their messages. Live-streamed updates can prove even more effective as the real-time nature of live events encourages more people to participate and interact with each other. Live video can also be archived into a library of visual content for training and other purposes. According to studies from the Social Science Research Network, as much as 68 per cent of the world’s population would classify themselves as “visual learners”. These individuals respond far better to communication presented in a visual format and retain and learn more from video or image-led content than they do from long-form text. According to our, 58 per cent of UK employees find visual content easier to digest than written documents. Given this majority, companies that continue to communicate with employees primarily through written forms will find themselves increasingly disconnected from their workforce and ultimately, at a competitive disadvantage. 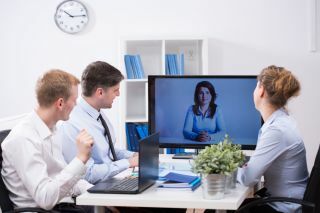 By switching to a more visual medium such as a video newsletter, live-streamed updates or virtual town hall meetings, senior management can be more confident their messages are being absorbed and understood, rather than being banished to the recycle bin. With many employees failing to read and engage with written updates and email content there is a growing risk that information will not be adequately understood. This failure to engage with official updates is encouraging many employees to find out company news through colleagues, unofficial sources or the “grapevine”. As it stands, 78 per cent of employees across both the UK and the US claim to get most of their company information from colleagues rather than from official channels. Even more shockingly, as many as 49 per cent find out information about their company’s future by reading about it in the media. Given this layer of abstraction, it’s all too easy for rumours, misunderstandings and misinformation to spread. This can lead to mixed messages, demotivated employees and a workforce that feels like it’s not being kept in the loop. By switching from traditional, text-based updates to video communication, businesses can ensure that employees are engaging with content directly from the source. Video communication also has the benefit of being far less open to interpretation, and is widely considered more trustworthy than written text. With the use of video analytics, businesses can also see exactly who is and isn’t joining a livestream or engaging, and how much of the update they view. Identifying these trends will help companies better tailor their video communications strategies to their audiences’ needs. For many companies, the decision to convey corporate updates via email or printed newsletter has not come down to what’s best for employees, but rather what is the most cost-effective and easy to implement and manage from an IT perspective. While organisations of all sizes are accustomed to producing written content, many still view video production and distribution as both expensive and time consuming. Recently, effort and costs involved in video content creation and delivery have come down drastically. As network infrastructure improves and becomes increasingly software-defined, businesses looking to provide live-streamed updates to even hundreds of thousands of employees no longer need to worry about potentially crashing their networks. With little more than a digital video camera and the correct network infrastructure, CEOs and senior managers can realistically move beyond simple video newsletters to provide direct, real-time updates to all staff around the globe on a regular basis. While it’s clear that companies must keep their employees in the loop, many are failing to approach office communication in a manner that fits with the employee schedules and expectations of today. According to our research, 45 per cent of US employees aren’t satisfied with the communication they receive from their senior team – a figure that rises even higher in the UK. Given this significant disconnect, businesses must examine new ways to engage with staff and move outside of their comfort zones to try new, real-time, and increasingly visual approaches towards office communication. Whether a video newsletter, live-streamed webinar or virtual town hall meeting, the communication of tomorrow must look beyond the humble office newsletter of yesterday.